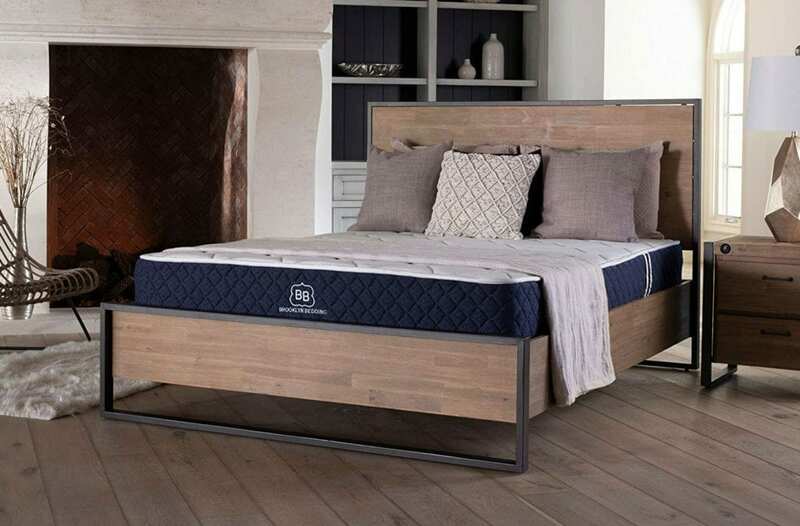 Brooklyn Bedding (BB) began 2018 with a different mattress, the Brooklyn Signature. BB billed this as an update or revision of its flagship model, #BestMattressEver: “The #BestMattressEver just got better.” However, this has been challenged by some mattress reviewers, who consider this as more than a revision, or even a renovation, but a new model replacing the former one. Signature has different materials in the comfort and transition layers. The #BestMattressEver used latex in the top two layers: soft Talalay latex in the 2” top comfort layer, and firmer Dunlop latex in the 2” middle (transition) layer. Both of these have been replaced by a new latex-like foam called TitanFlex. More significantly, instead of a foam support core, the Signature has pocket coils. Actually, this change was after the shift from latex to TitanFlex. At first, the Signature had a foam support core, then BB converted it to coils. The first change could be taken as a revision, similar to the one in The Casper Mattress. It is part of a trend among several manufacturers of lesser-priced mattresses. Although advantages of the new foams’ properties are cited (such as being cooler), the deciding factor for some seems to be cost. Even with the costs of research and development factored in, the new materials are less costly than natural and synthetic latex. Also, the manufacturers of the new latex-like foams may be keeping the price down to encourage use of these new foams, counting on sales volume to cover R&D. Taken together, new foam on top plus changing from foam to coils beneath, Sleep Like the Dead (SLTD) graded Brooklyn Bedding D+ for “Integrity of customer reviews” because they just added reviews for the Brooklyn Signature to those for #BestMattressEver. In other words, at least as far as reviews are concerned, SLTD thinks Signature should have been treated as a different model. Further down, we’ll see how this actually works out. The Brooklyn Signature mattress is 11” high in five levels: Cover, Comfort Layer, Transition Layer, Support Core, and Base Pad. All foams used by Brooklyn Bedding are certified by CertiPUR-US. The mattresses are made in the USA in BB’s own factory in Arizona. The cover of the Signature, like that of #BestMattressEver (BME), is quilted with foam and cotton. Whereas the BME cover fabric was cotton, Signature’s is a polyester-cotton blend. BB cites coolness as a feature of this cover. However, unless there is special provision for airflow (as with Selectabed’s Kool-Flow fabric) or special temperature-regulating materials, many reviewers say a quilt blocks airflow and keeps the mattress from cooling. The 2” comfort layer of the Brooklyn Signature mattress is made of a new material called TitanFlex. This is a latex-like foam, one of several being used in revisions of latex mattresses. It is less costly than natural or synthetic latex. It is polyurethane foam which has been engineered to have properties of latex, especially resiliency. Besides lower cost, latex-like foams such as TitanFlex have a few advantages. First is no fear of latex allergies. However, when it comes to latex foam in a mattress, the user really has little-to-no contact with the foam. Besides this, the allergy-causing proteins of the latex are washed out during the Talalay process, and even in newer versions of the Dunlop process. When it comes to synthetic latex, there is no latex allergy issue at all. Second, some – like Brooklyn Bedding – say that the latex-like foam sleeps cooler than latex, because it is more open-celled. However, most Talalay latex (as in the top layer of BME) is vertically ventilated for airflow, therefore letting more air flow through than just open-cell foam. TitanFlex is infused with TitaniumGel for better conduction of heat away from the sleeper (this is the origin of the TitanFlex name). It would be easy for some of us to dismiss the name of the gel in the infusion as hype, but there is a gel containing titanium. According to a 1998 research report, titanium gel was made from metallic titanium and hydrogen peroxide. The gel has a significant amount of titanium, accounting for greater thermal conductivity than traditional gels. Brooklyn Bedding is not alone in using this material – Serta now uses Titanium Gel in their Gel Foam Mattresses. The 2” transition layer is a firmer version of TitanFlex. This is graduated support, following the example set by the Tri-Pedic by Selectabed: the firmness of three or more layers gradually increases from top to bottom for smoother support. This also reduces both over-flexing and overcompression of the softest foams. When Brooklyn Bedding changed the composition of the upper layers of BME, they changed the name to Brooklyn Signature. Sometime after this, they replaced the polyurethane foam in the support core with 6” high individually-encased pocket coils, making it a hybrid mattress. A base pad was not needed in #BestMattressEver, but pocket coils need underlying support, unlike Bonnell, offset, and continuous coils, which are tied together (at least at the bottom in the case of offset coils). The Brooklyn Signature has a 1” base pad of extra firm polyurethane foam to hold the bottoms of the pocket coils, helping them perform as designed. The Brooklyn Signature is available only online on the Brooklyn Bedding site and on Amazon as well as in the company’s stores (showrooms) and participating retailers. It is compressed and rolled, put into a box, and shipped by FedEx or picked up at the showroom or store. Customers buying the Brooklyn Signature choose the firmness of their mattress: Soft, Medium, or Firm. Prices range from $599 for Twin to $1249 for King and Cal King on the company’s site, but $479.20 (Twin Firm) to $999.20 (King/CalKing Soft) on Amazon. The Brooklyn Signature comes with a 10-year warranty. The sleep trial is for 120 days. Observation: Since Brooklyn Bedding introduced the hybrid version with pocket coils under the same name some of the older reviews may be for the all-foam version instead of the current one. Customer ratings for the Brooklyn Signature are found on the Brooklyn Bedding site and on Amazon. Those on Brooklyn Bedding are a continuation of those for the #BestMattressEver, so we won’t use them here. On Amazon, with 56 reviews so far, the average rating for the Signature is 4.2. Many customers said the mattress setup was easy. Others said they did not feel the springs. Customer service received a high rating from most. The resilient support was cited. On the Cons side, one reviewer said comfort levels were not consistent between two mattresses, both ordered as “Medium” firmness, which makes it sound as though they were different versions. Another said it was hot. One reviewer said it got soft after a year, but since that customer had it at least a year, it may have been the previous all-foam version.